THE SNEEZE’ is a collection of seven short plays and sketches by Anton Chekhov and translated by Michael Frayn. 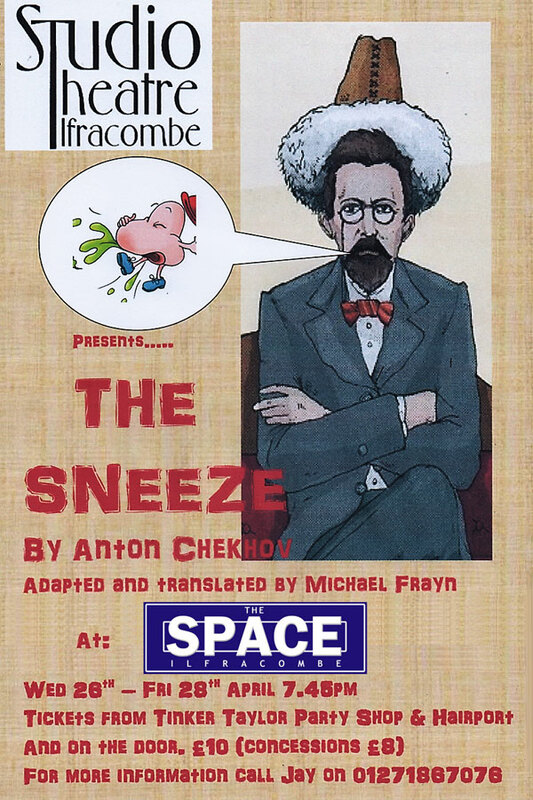 The Sneeze will be performed by Studio Theatre at ‘The Space’ Wilder Road, Ilfracombe. Concessions £8 (including SPACE Supporters). Book online – complete the form below to ensure your seats – please pay on the door. Through shops – available from Tinker Tailor Party Shop and Hairport in Ilfracombe High Street. Call Jay on 01271 867078 for more details. Book for Thursday 27 April below. Or click to book for Wednesday 26 April or Friday 28 April.